On the project's main page, click the Add/remove people button right beside people’s avatars. The next screen shows you everyone already on the project. 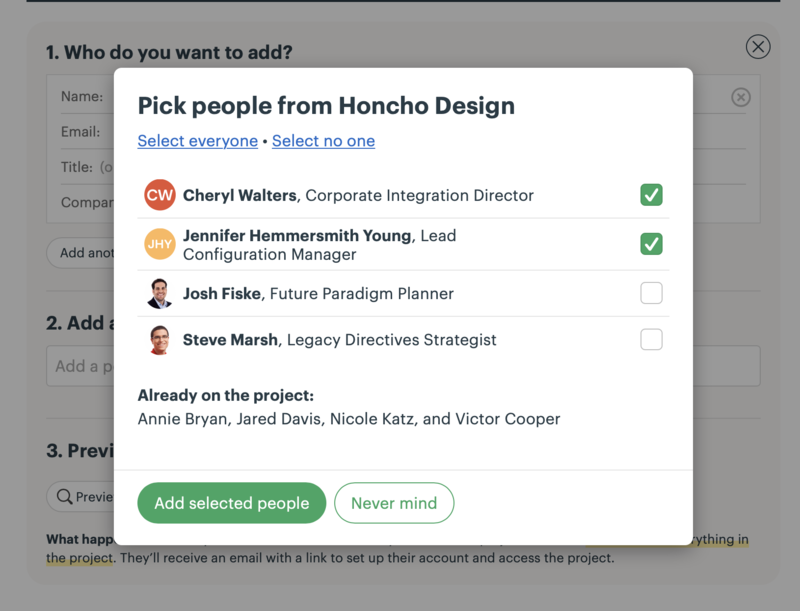 Click the green +Add people button to invite people to the project — either as part of your own team, or as a client. 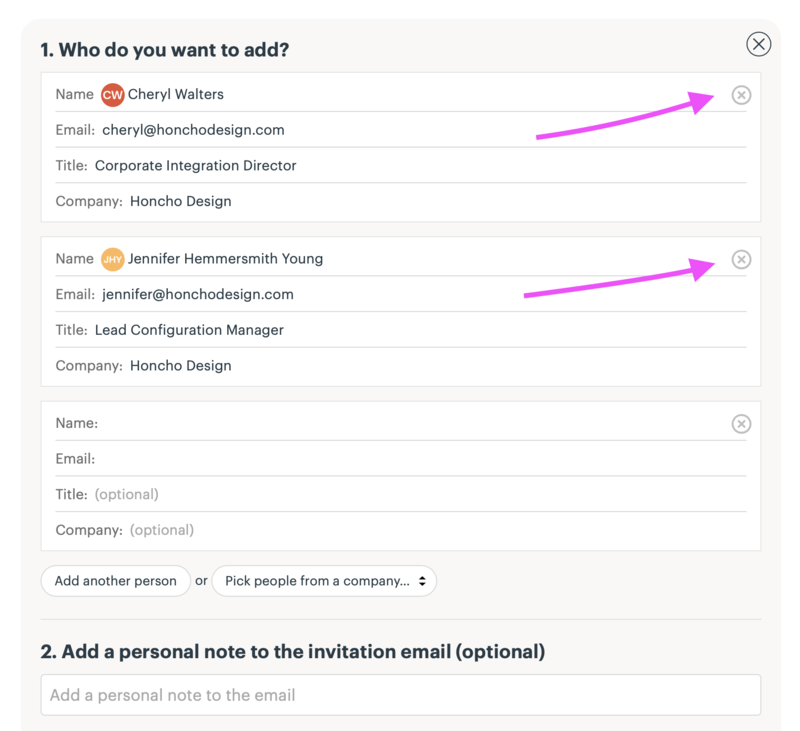 After you choose to add people to your team, you'll enter their names and email addresses. (Note: if you're working with a client, you'll add their info separately.) 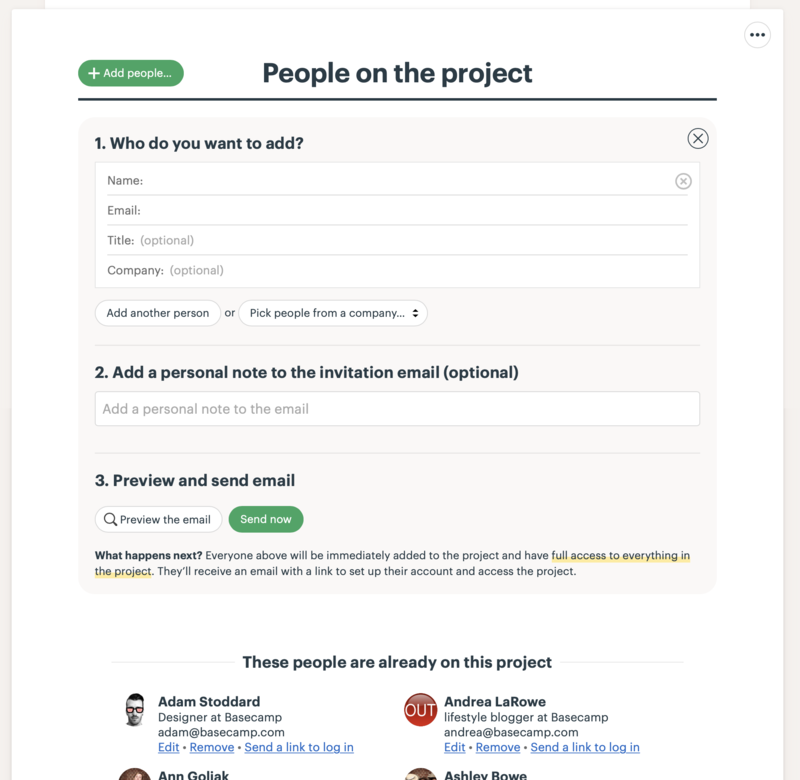 People you invite will be immediately added to the project so they can post messages, comment on things, and be assigned to-dos. Each person will receive an email that includes a link to join the project and set up their account if they haven’t already. It's not possible to import users' addresses from an external file. You'll need to add each user name and email address manually. Click the ••• menu button in the upper-right corner for another way you can get people into your projects. 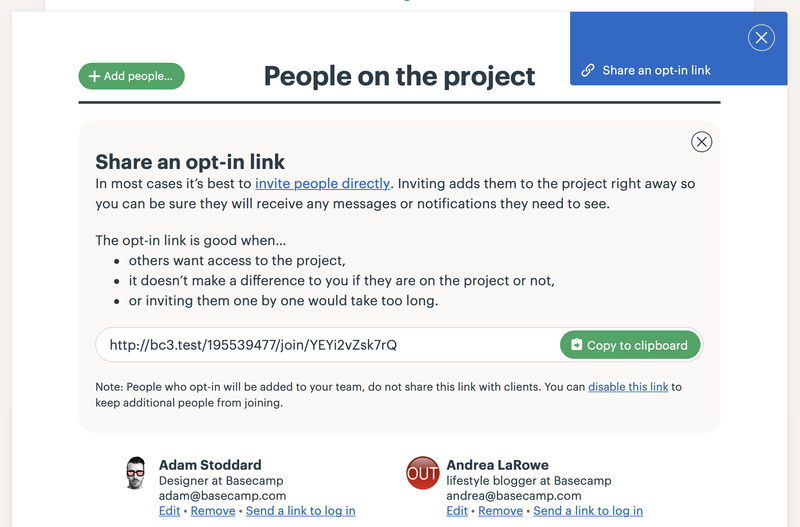 Invite people to join your project by sharing the opt-in link with them. Simply click the Copy to clipboard button next to the link and share it with others. People can paste that link directly into their browser to join the project! Type the client company name, and any client contacts you'd like to invite. 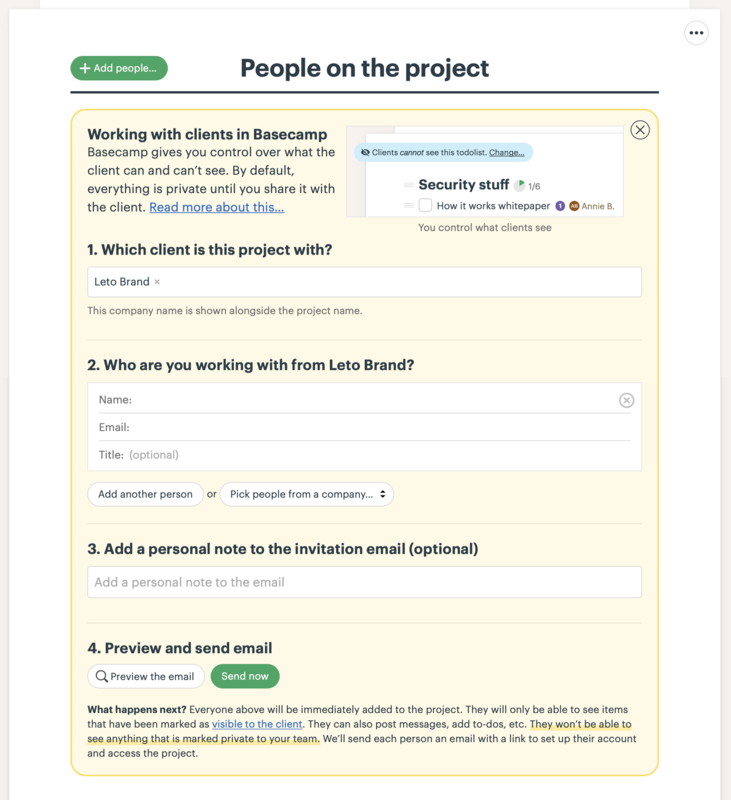 You can only add a client to a Project (not a Team). Learn more about working with clients. When you invite a user into the account, you can make them part of an organization or company. 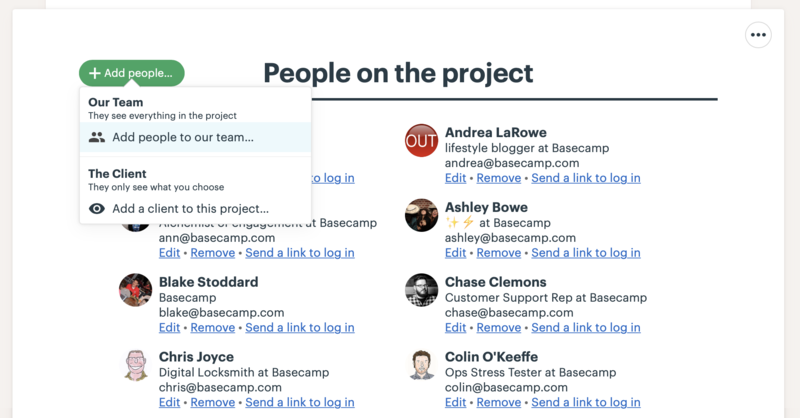 Just type the name of the organization into the invitation screen, and Basecamp creates it on the spot. Or, you can choose from an organization that's already on the account. Just start typing the name and that option will appear. 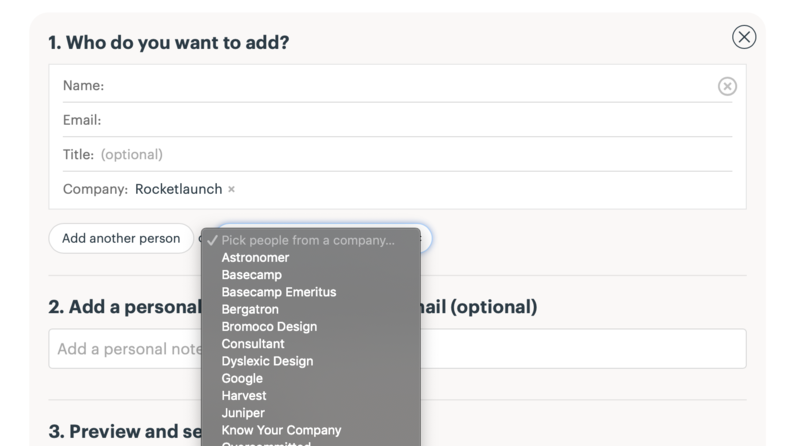 To invite a bunch of people from the same company at once, click the Pick people from a company dropdown and select the company you’d like to add people from. Then choose people from that company to be added to the form. You’ll be able to remove them before you send the invitations if you make a mistake. 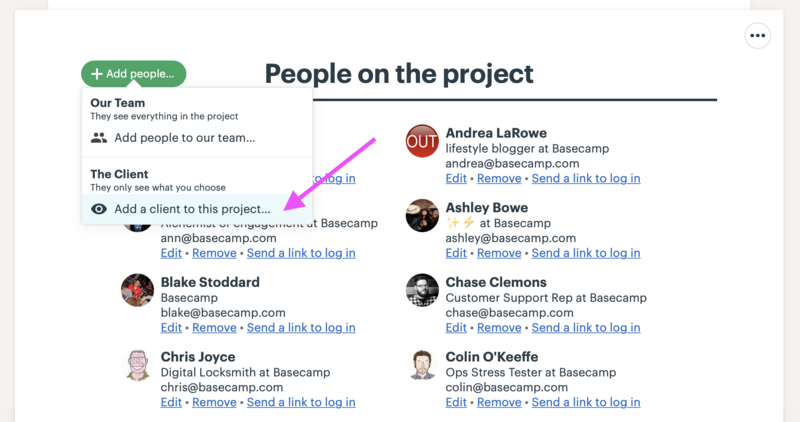 Note: When adding people, you'll only see those with whom you already share a Project, Team, or Company HQ. Admins can see everyone from their company. If one of your users lost their invitation email, or can't remember how to log in, you can help them out! Click on the Add/remove people button at the top of your project page. You'll see everyone in the project, and beneath their names, you'll have the option to "Send a link to log in." Voila! We'll send an email to your user who hasn't accepted their invitation. If they have accepted the invitation already, they'll get linked straight to the login screen. 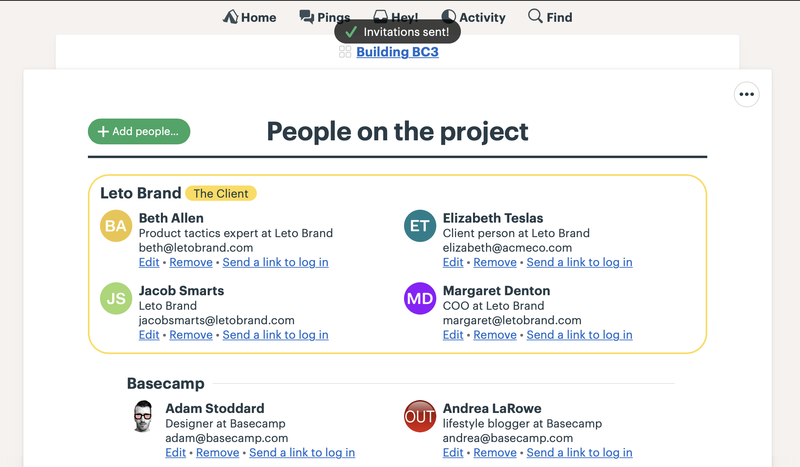 Note: While an invitation to Basecamp is pending, the only people who can edit someone's info are admins or the person who originally invited them. 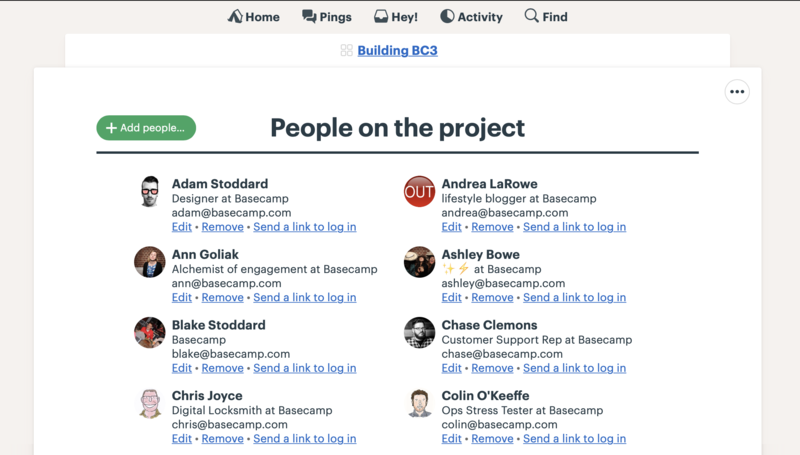 Once someone has joined Basecamp, you won't be able to update their name or email address anymore. That person will have to make those changes themselves.